When I decided to pursue my further studies in my field of interest, I made an informed decision based on factors like the quality of the institute, the future prospects, the quality of students I would have as my peers and the likes. My decision had to be taken keeping all the aspects in mind rather than just based on the fact that few of my school friends were coming along as well. Both the heart and mind had to work together. We strive to keep our loved ones happy and smiling all the time. From surprising them with calls at unexpected times to giving sweet little gifts and caring for them when they least expect, our loved ones drive our world forward. Do you ever think twice before taking your girlfriend / wife out on a dinner date to Marriott despite the fact that it may burn a whole in your pocket? Do you ever think twice before surprising your parents on their 25th anniversary despite being loaded with office work? Do you ever think twice about seeing off your loved ones at the airport despite having to go to work the next day? Do you ever think twice about getting that chocolate or toy for your child? Do you ever think twice before buying a gift for your loved ones with your first salary? I am sure there would be quite a few who would think practically in such instances as well. But let’s leave that for another discussion. Many of us would take decisions from the heart because the happiness of our loved ones means the world to us. Without their heartwarming smile, our world is nothing but a secluded place. In these instances, we don’t worry about practical things in life like money, time, energy and the likes. All these become immaterial in the larger scheme of things to see the smile and happiness on the faces of our loved ones. It’s during times like these when the heart wins the battle with the mind. When we think only from the heart, our decisions are taken emotionally. 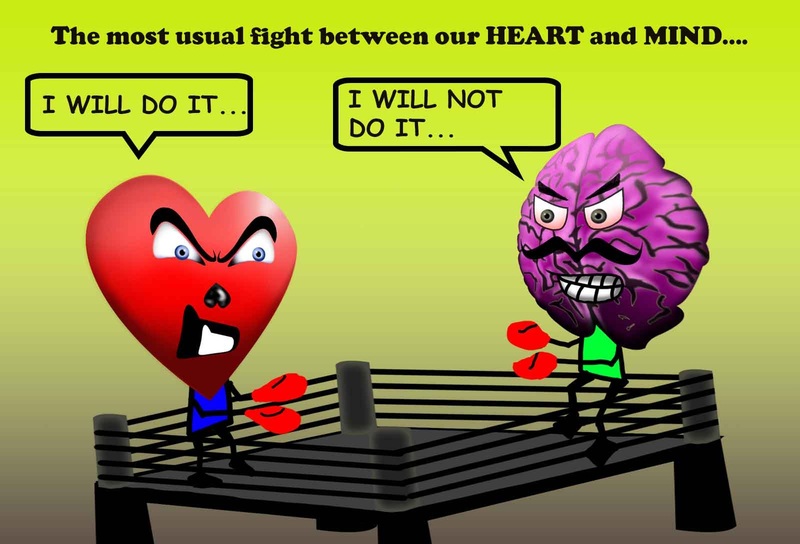 Though it’s fine when there are matters concerning the heart, but many hard decisions in life need to be taken by keeping the heart and mind in complete sync with each other. Linking to NaBloPoMo (National Blog Post Month – April – My post no 2 for this month. Absolutely agree, there is a conflict most of the times. In emotional aspects, we do and should listen to our heart. Money is something that should come secondary, i believe. True Alok. But in today’s money minded world, money rules most of the time.